Houghton Mifflin Harcourt, 9780151013449, 288pp. “Why are you so unhappy?” That’s the question that Zeke Pappas, a thirty-three-year-old scholar, asks almost everybody he meets as part of an obsessive project, “The Inventory of American Unhappiness.” The answers he receives—a mix of true sadness and absurd complaint—create a collage of woe. Zeke, meanwhile, remains delightfully oblivious to the increasingly harsh realities that threaten his daily routine, opting instead to focus his energy on finding the perfect mate so that he can gain custody of his orphaned nieces. Following steps outlined in a women’s magazine, the ever-optimistic Zeke identifies some “prospects”: a newly divorced neighbor, a coffeehouse barista, his administrative assistant, and Sofia Coppola (“Why not aim high?”). A clairvoyant when it comes to the Starbucks orders of strangers, a quixotic renegade when it comes to the federal bureaucracy, and a devoted believer in the afternoon cocktail and the evening binge, Zeke has an irreverent voice that is a marvel of lacerating wit and heart-on-sleeve emotion, underscored by a creeping paranoia and made more urgent by the hope that if he can only find a wife, he might have a second chance at life. 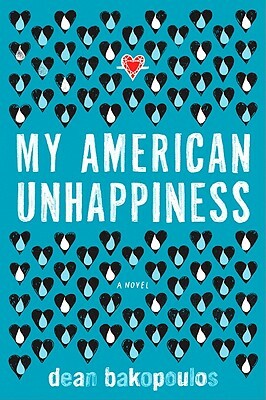 -Library Journal"My American Unhappiness is a smart, funny, charming novel - an incisive critique of the way we live now, but aremed, unlike contemporary satire, with a big, generous heart. I got addicted to the misadventures of Zeke Pappas. I didn't want the book to end." "Dean Bakopoulos in an American prophet -- who divines the end of optimism in this brilliant new novel that will choke you with tears and laughter. My American Unhappiness deserves a hallowed place on the shelf somewhere among Studs Terkel's Working and Walker Percy's The Moviegoer. "